Abstract: Through her facial expression we could see that Na is a much healthier person today compared to the day she first visited us eight months ago. After taking the herbs she felt “good”. She said she is happy and satisfied. It is this “goodness” that also we see in the form of “green” bars in the AcuGraph chart. In our earlier paper we presented data showing that the AcuGraph, when used and interpreted properly, could be another non-invasive tool for monitoring a patient’s treatment progress. It is truly a state-of-the-art, objective method of evaluation (1). Almost all patients who come to CA Care have undergone medical treatments which failed them. Coming to seek our help appears to be their last “one hope.” Our responsibility to our patients is to provide advice and treatments based on current and concrete evidence – not dubious claims reported years ago. It is therefore important that any protocol we recommend or adopt be first extensively evaluated. We started to incorporate acugraphing into our practice in early 2010 and since then had accumulated much data. This paper is among the many reports which we shall be writing regarding our experience on the “reliability, effectiveness and usefulness” of the AcuGraph. At CA Care, patients do their AcuGraph reading free-of-charge. We earn no extra fee. Our priority is to provide effective help, not generating extra income. We do not compromise on this principle. Na (not real name, H357) is a 44-year-old female. In August 2009, she felt a small lump (1.2 cm) in her right breast. She underwent a lumpectomy on 28 October 2009. Unfortunately the surgery resulted in “internal bleeding”. Na sought the help of another surgeon in another private hospital. A second surgery was done to drain the blood. Na was asked to undergo chemotherapy, radiotherapy and take Tamoxifen for her breast cancer. She declined further medical treatment. She came to CA Care on 23 July 2010 for help. She was prescribed herbs for her breast cancer: Capsule A, C-tea and Breast M tea. Reading of her meridian was done using the Acugraph. At the same time, we requested that Na go for her blood test. Figure 1: AcuGraph reading on 23 July 2010, 24 September 2010 and 29 October 2010 showing improved balance of meridian energy after taking herbs (arrows). On 23 July 2010, the AcuGraph reading showed both her LU (lung) and LI (large intestine) energy were low. 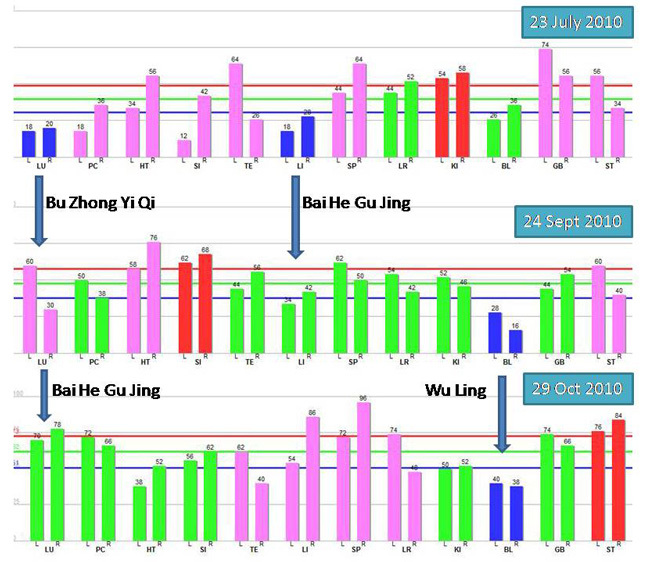 Based on the recommendations obtained from the AcuGraph, two herbal teas were prescribed for Na: Bu Zhong Yi Qi for low lung energy and Bai He Gu Jing for her low LI energy (arrows). On 24 September 2010, her AcuGraph reading showed split lung energy — a change from the previous low. Based on the herbal recommendation, Na was again prescribed Bai He Gu Jing for her split lung meridian. The previous low LI meridian energy had normalized and no further herb was prescribed. However, the AcuGraph showed low BL (bladder) energy. To correct this imbalance, we prescribed Na, Wu Ling (arrows). The Acugraph reading on 29 October 2010 showed normal LU meridian. Na told us that since childhood, her breathing was not “smooth” and she felt “stuck” when taking a deep breath. This problem has resolved. The energy of BL meridian had increased but was still low. Previously Na had to wake up rather frequently at night to empty her bladder. However after taking the Wu Ling her urination had improved. The reading done on 29 October 2010 showed disharmonies of the SP (spleen) and LR (liver) meridians. We did not attempt to balance these because we believe this disharmony is a natural phenomenon experienced with women about to commence her menses. Through her facial expression we could see that Na is a much healthier person today compared to the day she first visited us eight months ago. After taking the herbs she felt “good”. She said she is happy and satisfied. It is this “goodness” that we see in the form of “green” bars in the charts. Low LU energy by drinking Bu Zhong Yi Qi. Low LI energy by drinking Bai He Gu Jing. Split LU energy by drinking Bai He Gu Jing. Low BL energy by drinking Wu Ling. The recommendations to prescribe these herbs are obtained from the AcuGraph 3. Therefore as far as these disharmonies are concerned we can say with confidence that the information given is reliable. We are able to predict and replicate such results in other patients. The herbal recommendation provided by the AcuGraph comes in the form of easy-to-swallow tablet. In our case, we used raw herbs blended into an herbal tea. Patient needs to brew and drink the concoction.